Myocardial injury caused by ischemia followed by reperfusion mediates a complex series of inflammatory response that reduces the benefit of medical interventions, such as percutaneous coronary intervention, thrombolytic therapy, and coronary bypass surgery. Therefore, suppression of Ischemia/Reperfusion (I/R) -mediated myocardial injury is important in clinical practice. The objective of this study was to investigate whether vitamin has some protective effect on heart after myocardial I/R, and the mechanistic pathway of this effect. Adult (4 - 6 months) male Albino-Webster mice were randomly divided into 2 groups: (1) sham-control group, (2) Ischemia and Reperfusion (I/R) operated group, (3) vehicle-treated group, and (4) vitamin D-treated group receiving vitamin D 20 mg/kg once daily shortly before I/R. 72h later, hemodynamics and Evan blue staining were applied to evaluate cardiac function and Area At Risk (AAR). ELISA technique are applied to investigate myocardial and plasma expression of cytokines (IL-1β, IL-6, and TNF-α), chemokine (MCP-1), and cTn-I. In addition, the activity of pERK1/2 was analyzed by Western blot. Further, the ischemia changes and myocytes injured were examined by Hematoxylin and Eosin (H&E) stain. The results demonstrated that the treatment of vitamin D markedly improved Left Ventricular Function (LVF) in mice, and reduced plasma level of cTn-I as marker of cardiac injury. Moreover, the effects of vitamin D was associated with attenuations in both chemokine and cytokines expression following I/R, through down-regulation of activation of ERK1/2 pathway. Together, the present study results show that the treatment with vitamin D was able to improve LV function after I/R, which was associated with the reductions of inflammatory response and activity of pERK1/2 as mechanistic of its action. Keywords: Vitamin D, Myocardial ischemia and reperfusion, ERK1/2, Cytokines, IL-1β. © 2018 Habooby et al. Ischemic heart disease is the most common of human disability and unless the previous trends are changed, it will continue to be the most common cause of death in 2030. [1Fuster V, Kelly BB, Eds. Promoting cardiovascular health in the developing world. A Critical Challenge to Achieve Global Health Institute of Medicine (US) Committee on Preventing the Global Epidemic of Cardiovascular Disease: Meeting the Challenges in Developing Countries 2010.] Ischemia and Reperfusion (I/R) injury, a general healthy problem, is due to the restoration of blood after the time of coronary artery impaired. It associates with a series of clinical situations such as, angioplasty [2Austin E, Yousif NG, Ao L, et al. Ghrelin reduces myocardial injury following global ischemia and reperfusion via suppression of myocardial inflammatory response. Ameri J BioMed 2013; 1(2): 38-48. [http://dx.doi.org/10.18081/ajbm/2333-5106-013-12/38-48] ], coronary bypass surgery myocardial infarction, heart transplantation [3Caroline M, Michelsen T, Lorenz DM, et al. Cytoplasmic double-stranded DNA trigger NALP3 after global myocardial I/R: Crosstalk AIM2/ inflammasome. Pathophysiology of cell injury journal 2015; 4(1): 1-12.]. The restorations flow of blood supply to an ischemic heart refers to myocardial reperfusion which induced myocardial injury [4Durum R, Memon JF, Mackall TN, et al. Critical role of farnesyltransferase inhibitor in protective myocardial function after endotoxemia in rat model. AmeriJ BioMedi 2015; 2(7): 827-39.]. Reperfusion of ischemic tissue results in a local and a systemic inflammatory response that may result in wide range of microvascular dysfunction and changing in tissue barrier function [5Goodman J, Putensen AA, Calandra RH, et al. Critical role of macrophage migration inhibitory factor in sepsis via interfere with MCP-1/CCL2 signaling pathway. Ameri Jour BioMedi 2015; 2(6): 688-701.]. The inflammatory response after ischemia and reperfusion may also produce in the systemic inflammatory response syndrome or the multiple organ dysfunction syndromes, which account for up to thirty to forty percentage of intensive care unit mortality [6Grupper R, Edward R, Walter C, et al. Critical role of microRNAs after global myocardial ischemia and reperfusuion. AmeriJBioMedi 2015; 3(7): 451-67., 7Hullmann G, Azfer MA, Hensley J, et al. Role of IL-1B in TLR4-mediated MCP-1expression: Renal sepsis. Ameri J Bio Medi 2015; 3(1): 22-31.]. Vitamin D (vit D) is a fat-soluble vitamin and prohormone steroid and not only influences bone metabolism by regulation of calcium and phosphate homeostasis but also plays a central role in cell functions such as differentiation, multiplication, and metabolism [8Ogiku L, et al. Meloxicam attenuates brain cell injury following cerebral ischemia and reperfusion via down regulation of proinflammatory response. Pathophysi Cell I J 2013; 2(1): 1-11.]. Also, vitamin D has effects on the cardiovascular effect and immunological action and given resistance to infection, as well as its anti-proliferative and anti-inflammatory activity [9Ramote D, Kishony J, Bren L. Role of Monocyte Chemoattractant Protein-1 (MCP-1) in atherosclerosis: Signature of monocytes and macrophages. AmeriJ BioMedi 2013; 2(1): 67-79.]. Another study on renal dysfunction showed that the vitamin D receptor analogue paricalcitol may have beneficial effects in terms of preventing renal I/R injury [10Yousif NG. Fibronectin promotes migration and invasion of ovarian cancer cells through upregulation of FAK–PI3K/Akt pathway. Cell biol intern 2013; 38(1): 85-91.]. The ERK1/2 signaling pathway is a family of serine-threonine kinases that are associated with cell survival and proliferation [11Rink L, Hebel T, Fukumot J. Sepsis and signal transduction pathway: Cross-talk TLR4/ MyD88/TRIF. AmeriJ BioMedi 2015; 3(4): 150-63.]. While, other studies showed that the activation of ERK can mediate cell death depending on the stimuli and cell types involved. However, the molecular mechanisms that define the conditions for ERK-mediated cell death remain poorly understood [12Rispens E, Bron A, Lee J, Fukumoto J. The pathophysiology of inflammation in cell injury. Pathophysi Cell I J 2014; 3(1): 1-9.]. To understanding the mechanistic pathway of Vitamin D following I/R, we tested the hypothesis that vit D improved cardiac function after I/R through downregulation of ERK1/2 pathway. Adult (4 - 6 months) male Albino-Webster mice, and their weights ranged from 25 to 30 gm obtained from the College of Science, Babylon University. Mice were acclimated for 14 days in a 12:12 h light-dark cycle with free access to water and regular chow diet before the experiments in animal house of Kufa University and this investigation conforms to the Guide for the Care and Use of Laboratory Animals (National Research Council, revised 1996). The study included four experimental mice groups: (1) sham, (2) control I/R, (3) I/R + vehicle, and I/R + vitamin D (each group contained eight mice). The treatment group received low dose vit D (1 mcg/kg dissolved in olive oil) (GL Biochem, China) through intraperitoneal (i.p) injection ½ h before reperfusion [13Slimani H, Zhai Y, Yousif NG, et al. Enhanced monocyte chemoattractant protein-1 production in aging mice exaggerates cardiac depression during endotoxemia. Crit Care 2014; 18(5): 527. [http://dx.doi.org/10.1186/s13054-014-0527-8] [PMID: 25209241] ]. The mice I/R procedure was performed as previously described [14Tateda K, Matsumoto T, Miyazaki S, Yamaguchi K. Lipopolysaccharide-induced lethality and cytokine production in aged mice. Infect Immun 1996; 64(3): 769-74. [PMID: 8641780] , 15Turler M, et al. Dopamine signaling attenuated myocardial injury during endotoxemia. AmeriJBioMedi 2015; 3(7): 381-91.]. The animals were anaesthetized by i.p. injection of ketamine (Delta Select company, Dreieich, Germany) and xylazine (Rompun; Bayer, Leverkusen, Germany). The mice were orally intubated and then connected to a mouse ventilator. A left thoracotomy was performed through incision pass horizontally at the 3rd intercostal space. The operation of I/R was achieved by ligating the anterior left descending (LAD) artery with silk suture size (8-0), and silicon tubing (PE-10) was placed on top of the (LAD), about 2-mm just below the distal border between the left atrium and left ventricle. The sham mice were subjected to the same procedures, but without LAD occluded. After 30 min of occlusion, the silicon tube was removed to achieve reperfusion, and the rib space and overlying muscles were closed. The mouse was then allowed to breathe room air and monitored during the recovery period, which was generally complete within 15 min. No artificial respiratory aid was required during the recovery time. We assessed cardiac function as described [14Tateda K, Matsumoto T, Miyazaki S, Yamaguchi K. Lipopolysaccharide-induced lethality and cytokine production in aged mice. Infect Immun 1996; 64(3): 769-74. [PMID: 8641780] , 15Turler M, et al. Dopamine signaling attenuated myocardial injury during endotoxemia. AmeriJBioMedi 2015; 3(7): 381-91.]. Briefly, mice were anesthetized intraperitoneally with ketamin in dose of (50 mg/kg) post endotoxemia. Animals were laid supine on a heating blanket and body temperature was maintained at a range 37°C ± 0.5°C. The external right carotid artery was exposed, and a micro-tipped transducer catheter (Millar Instrument Inc., 1.4F size) was placed into the artery and then advanced into the LV. The other end of the catheter was connected to an electrostatic chart recorder (Cleveland, model, ES 2000 size, Gould, USA) and Pressure-volume loops recorded to measure the maximum rate of change in ventricular pressure and ejection fraction by using the MPVS-400 system with the aid of P van software (Conductance Technologies, San Antonio, TX, and Millar, Houston, TX) was used to measure all data. Heart rates, LV End-Diastolic Pressure (LVEDP), LV Systolic Pressure (LVSP). The Evans blue is an azo dye that, when injected into the circulation, binds tightly to plasma albumin and distributes to perfused tissue, staining the tissue dark blue after occlusion of LAD, the myocardium is stained by injecting a dye into the circulation, through retrograde perfusion The heart tissue was excised, and sliced into 1 mm thick cross sections. The normal myocardium will be stained red, and ischemic tissue presented as a white area. The ischemic area and the area that closed to it called Area At Risk (AAR), all LV area from each sliced were measured using Image-Pro Plus software (Media Cybernetics, Inc. company, USA); the obtained values were the ratio of area at risk/LV and the ratio of infarct area/area at risk were calculated and expressed as a percentage as described [16Yousif NG, Al-Amran FG. Novel Toll-like receptor-4 deficiency attenuates trastuzumab (Herceptin) induced cardiac injury in mice. BMC Cardiovasc Disord 2011; 11: 62. [http://dx.doi.org/10.1186/1471-2261-11-62] [PMID: 21999911] , 17Redfors B, Shao Y, Omerovic E. Myocardial infarct size and area at risk assessment in mice. Exp Clin Cardiol 2012; 17(4): 268-72. [PMID: 23592952] ]. The blood was drawn using direct needle puncture of the heart. For plasma collection heparin was used as anticoagulant as warranted for the particular test, the samples were stored at 4°C, centrifuged at 4700 × g for 10 min at 4°C, and the plasma was collected and stored at −20°C until used for further analyses. For heart collection, a thoracic operation was performed; the heart of the mice was excised. Tissues samples of mice were cut into two parts: half of the samples were snap-frozen until use. The remaining samples were fixed for histological analysis. The breezed part of myocardial treated in PBS containing 0.5% Triton X100 with a protease inhibitor cocktail, tissue was homogenized and the supernatant used to quantify the chemokine and cytokines (MCP-1, TNF-α, IL-1β, and IL-6) in both plasma and myocardial tissue, in addition to the plasma cardiac Troponin-I (cTn-I) according the instruction of commercial ELISA kits (R&D Systems). The spectrophotometry of microplate reader (Bio-Rad Laboratories, USA) was used to determine the absorbance of standards and samples at 450 nm. All obtained data were plotted against the linear portion of a standard curve [18Yousif NG, Al-Amran FG, Hadi N, Lee J, Adrienne J. Expression of IL-32 modulates NF-κB and p38 MAP kinase pathways in human esophageal cancer. Cytokine 2013; 61(1): 223-7. [http://dx.doi.org/10.1016/j.cyto.2012.09.022] [PMID: 23107826] ]. Hearts were homogenized with rotator machine with protease inhibitor cocktail 0.02%(v/v), pH 7.4) [19Frame RG, Henderson Chien BK, Hazen EG. ERK5 promotes TLR2-dependent up-regulation of inflammatory mediator expression induces by global myocardial ischemia. Ameri J Bio Med 2014; 8: 903-13.]. Samples were centrifuged at 100,000 g for 10 min at 4oC, the supernatant was separate and divided into two parts. The first part used to determine the protein concentration after boiling for 10 min according to the instruction of BioRad Bradford assay company [20Vlaia M, et al. Cardiomyocyte injury: mechanism of doxorubicin toxicity effects. Pathophysi cell Inj 2014; 3(2): 73-82.]. While, the second part used to investigated bands of ERK1/2 by Western blot as described previously according to the manufacturer's instructions. Briefly, proteins were transferred onto immunoblot membranes with polyvinylidene difluoride (Millipore, Chemicon International, MA). All membranes were blocked for 2 h with 5% BSA in Tris-buffered saline + 0.1% Tween (TBS-T), and incubated at 4°C overnight with the primary antibodies: phospho-ERK1/2 (1:1000), β-actin (1:2000; Biotechnology). After washing membranes four times for 15 min with TBS-T, they incubated with horseradish peroxidase-labeled secondary goat anti-rabbit (1:2000; Santa Cruz) for 1-hour. The membranes were second time washed four times for 15 min each in TBS-T, enhanced chemiluminescence was used to develop membranes (plygen Company, China). Finally, membranes bands developed and imported into Adobe Photoshop software and semiquantitative was analysis by scanning densitometry through Image J 3.0 system. The cardiac tissue samples were fixed in 4% paraformaldehyde for 24 h, as described previously [6Grupper R, Edward R, Walter C, et al. Critical role of microRNAs after global myocardial ischemia and reperfusuion. AmeriJBioMedi 2015; 3(7): 451-67.]. Briefly, cardiac tissue sections (slices) 5μm in thickness were paraffin embedded according to the standard procedure. The degree of heart damage was analyzed by Hematoxylin and Eosin (H&E) satin, and photographs were obtained from each heart section (n = 3 sections per heart) under optical microscopy. 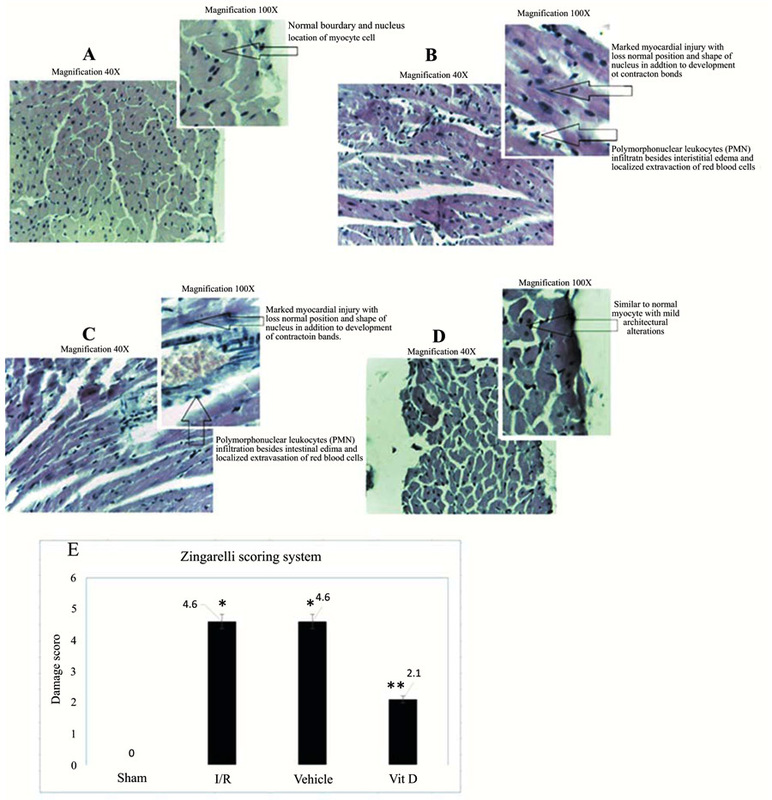 To semi-quantify the difference in cardiac damage, stained histological sections were examined and scored according to the protocol of Zingarelli was used [21Thron R, Andersson T, Lee K, et al. Over-expression of miR-486/miR-150 in sepsis: Marker in myocardial depression function. Ameri JBioMedi 2015; 3(6): 313-24.]. According to this scoring protocol the following criteria were used: score (0), normal tissue; score (1) mild, interstitial edema and focal necrosis; score (2) moderate, myocardial cell swelling, diffused necrosis; score (3) severe, the presence of ischemia, neutrophil accumulation; and score (4) highly severe, the presence of contraction bands, leukocyte infiltrate, ischemia, and hemorrhage. Statistical analysis data was performed using StatView software (Abacus Concepts, USA). Analysis of variance (ANOVA) with Fisher post-hoc test was used to investigate differences between mice, and data differences were confirmed using the Mann-Whitney U-test. Kaplan-Meier method used for plot the survival curves, and differences were evaluated by log-rank tests. Statistically the present data significance was defined as P ≤0.05. We determined whether Vit D improved cardiac function in mice following I/R. 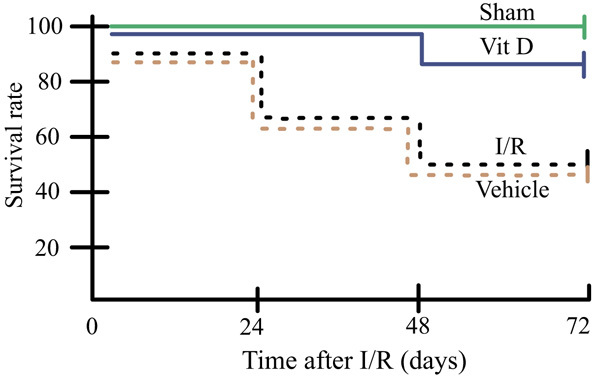 Heart rate increased in I/R, vehicle and vit D treated mice in comparison to sham. Compared to the sham group, ejection fraction and developed pressure reduced in I/R untreated mice. Similarly, cardiac output was decreased in both I/R and vehicle treatment. The representative pressure-volume loops in Fig. (1a ) and analyzed data in Table 1 show significantly greater improvements LV function of Vit D treated mice. Furthermore, the resulting data showed that significantly greater reduction in the plasma level of cTn-I reflected the potential role of vit D in decreased cardiac injurys following I/R as shown in (Fig. 1b ). Ischemia and reperfusion results in cardiac depression and myocardial injury in mice. Adult (4 - 6 months) male Albino-Webster mice were treated with vit D (0.5 mg/kg, ip) or vehicle. 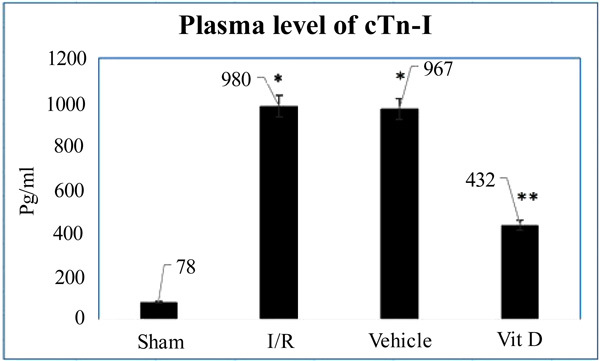 The greater reduction in level of cTn-I in plasma. Data are expressed as mean ± standard error; *P <0.05 versus corresponding sham; **P <0.05 versus I/R and Vehicle treatment. Mice were treated with vit D 72hr I/R. Untreated and vehicle mice displayed significantly reduced left ventricle (LV) function, including developed pressure, ejection fraction and cardiac output, compared with sham mice. Treatment with vitamin D improved LV function. Data are expressed as mean ± standard error, n = 8 in each group; *P <0.05 versus corresponding sham; **P <0.05 versus vitamin D treatment. Previous studies [22Zingarelli B, Salzman AL, Szabó C. Genetic disruption of poly (ADP-ribose) synthetase inhibits the expression of P-selectin and intercellular adhesion molecule-1 in myocardial ischemia/reperfusion injury. Circ Res 1998; 83(1): 85-94. [http://dx.doi.org/10.1161/01.RES.83.1.85] [PMID: 9670921] -24de Bragança AC, Volpini RA, Canale D, et al. Vitamin D deficiency aggravates ischemic acute kidney injury in rats. Physiol Rep 2015; 3(3): e12331. [http://dx.doi.org/10.14814/phy2.12331] [PMID: 25780095] ] showed that chemokine (MCP-1) is a potent chemoattractant for monocytes, and plays a substantial role in the accumulation of monocytes to the injured myocardium. We investigated the effects of vit D in neutralization of MCP-1 and subsequently, reduced the infiltration of accumulation of monocytes and macrophages in myocardium following I/R. In comparison to sham greater level of MCP-1 expression found in both I/R and vehicle treated mice group, and interestingly following 72h of reperfusion the levels of MCP-1 expressing in both plasma and myocardium markedly lower in treated mice with vit D following 72h of reperfusion as in (Figs. 2a and b ). I/R mice have higher levels of MCP-1 in the myocardium and plasma. Adult mice were treated with vit D (0.5 mg/kg, iv) or vehicle. Levels of MCP-1 was analyzed by ELISA 72 h after reperfusion. Vit D treated mice had lower levels of MCP-1 in plasma (A) and myocardial tissue (B). Data are expressed as mean ± standard error. *P <0.05 versus corresponding sham; **P <0.05 versus I/R and vehicle treated mice. The mechanisms responsible for inflammatory cytokines upregulation in the myocardial injured area have not been fully understood; however, complicated pathways implicated in initiating the inflammatory responses after I/R injury. Previous studies approved that IL-1β, IL-6 and TN-α are contributes to the regulation of inflammation after cardiac injury. Here, we investigate the potential effects of vit D to ameliorate inflammatory cytokines following I/R injury in mice model. Comparison with I/R and vehicle treated mice, vit D treated mice exhibit greater reduction in the levels of proinflammatory cytokines (IL-1β, IL-6 and TN-α) in both myocardium and plasma as in Figs. (3a and b ) *P <0.05 versus corresponding sham; **P <0.05 versus I/R and vehicle treatment. I/R mice have higher levels of proinflammatory cytokines in both myocardium and plasma. Adult mice were treated with vit D (0.5 mg/kg, iv) or vehicle. Levels of cytokines (IL1β, IL-6, and TN-α) were analyzed by ELISA 72 h after reperfusion. Vit D treated mice had lower levels of cytokines in plasma (A) and myocardial tissue (B). Data are expressed as mean ± standard error. 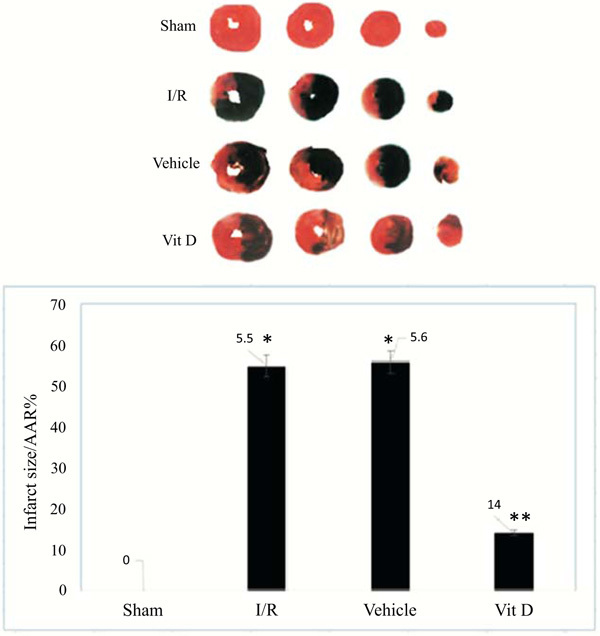 *P <0.05 versus corresponding sham; **P <0.05 versus I/R and vehicle treated mice. The pathway of ERK1/2 signaling in tissue injury has been thought to modulate tissue protection. In our study, we investigated the effects of vit D on down-regulation of ERK1/2 following myocardial I/R injury. As shown in Fig. (4 ), the expression of ERK1/2 investigated by Western blot analysis in order to explore whether the ERK1/2 signaling pathways are involved in the mechanistic effects of vit D following I/R. Compared with the I/R, and vehicle group mice, the phosphorylation of ERK1/2 were reduced after pretreatment with vit D; P<0.05. Myocardial tissue homogenates, and Western blot experiments were performed using the β-actin was normalized the results. Western blot demonstrating phosphorylation and total protein levels of (ERK1/2), Vit D treated mice displayed reduction in the levels of p-ERK1/2. Densities (Arbitrary Units, AU). Data are expressed as mean ± standard error; *P <0.05 versus corresponding sham; **P <0.05 versus I/R and vehicle. The histological changes in myocardial tissue obtained after 72 h from all groups staining by E&H stain following myocardial reperfusion. Comparison with sham, I/R and vehicle group mice showed high infiltration of monocytes and macrophages with edema and localized extravasation of red blood cells with score 4 according to the Zingarelli scoring system. Interestingly, the vit D treated group mice showed mild cellular alterations less monocyte infiltration without red blood cells extravasation and score 2 as in (Figs. 5a -e ). After 72 h reperfusion, the mice groups were subjected to relegation of LAD and 1 ml of 1% Evans blue was perfused retrograde through the left carotid artery to identify the area at risk (unstained-white) from viable myocardium tissue (stained-red) (Fig. 6 ). Hematoxylin and Eosin (H&E) stained of ventricular area. Histological sections stained with hematoxylin and eosin of hearts from sham, vehicle, and Vit D treated mice after 72-hour post I/R. In sham (A), myocardial tissue structurally clear, while the myocardial cells of I/R-mice and vehicle treated (B, C) had edema, inflammatory cells infiltration hemorrhage, and necrosis. While, vit D treated mice (D) attenuated cardiac injury. According to the Zingarelli scoring system; score 0 for sham mice group; 4 scoring to I/R alone and vehicle group; and score 2 (moderate) for vit D treated group (Fig. 5e ). Analysis of Area At Risk (AAR) of the heart in mice groups A. Analysis of AAR, the hearts were stained with Evans blue dye, with four sections. B. AAR was calculated as a percentage of total AAR. Data are shown as mean ± SEM (n = 8 in each group); **P < 0.05 vs. sham; **P < 0.05 vs. I/R/vehicle group. Vit D treated mice (n = 8), significantly reduced AAR, when analyzed as percentage of total LV area (14 ± 3% compared with 55 ± 3%; P < 0.01) distributes to perfused myocardium tissue, with dark blue staining. Further, the AAR will be left unstained and used quantitative analysis to identify AAR. The areas at risk, compared to sham mice I/R group developed larger infarcts (ratio of infarct size/area at risk) and not significantly different between I/R and vehicle treated groups. Interestingly, vit D treated mice subjected to I/R displayed smaller infarcts compared with sham and vehicle treated mice as in (Fig. 6b ). The survival rate of mice in the I/R and vehicle groups was 90% during first 24 h, 70% through next 24 h, and decreased to 50% at end of experiments (72h). Pre-treatment with vit D results in improvement of the survival rate to 90% through 72 h (P <0.05). The survival rates of mice groups were estimated by the Kaplan-Meier method and compared by using the log-rank test (Fig. 7 ). The reperfusion process following myocardial ischemic resulted in the microvascular dysfunction that appears impairment of endothelial wall that is involved in the dilation of arterioles [25Gianforcaro A, Hamadeh MJ. Vitamin D as a potential therapy in amyotrophic lateral sclerosis. CNS Neurosci Ther 2014; 20(2): 101-11. [http://dx.doi.org/10.1111/cns.12204] [PMID: 24428861] ], enhanced fluid filtration and leukocyte accumulation in micro-capillaries, and moving of leukocytes and plasma protein extravascular of capillary venules [26Sodha NR, Boodhwani M, Clements RT, Feng J, Xu SH, Sellke FW. Coronary microvascular dysfunction in the setting of chronic ischemia is independent of arginase activity. Microvasc Res 2008; 75(2): 238-46. [http://dx.doi.org/10.1016/j.mvr.2007.06.008] [PMID: 17707069] ]. The up-regulation of endothelial cells in all compartments of the micro-circulations produces more inflammatory mediators (cytokines and chemokines), in the initial period following reperfusion [27Yousif NG, Hadi N, Al-Amran F, Zigam Q. Cardioprotective effects of irbesartan in polymicrobial sepsis Herz 2017.]. The released pro-inflammatory cytokines mediate leukocyte-endothelial cell adhesion and more myocardial injury [28Yousif NG, Hadi NR, Hassan AM. Indocyanine green-001 (ICG-001) attenuates wnt/β-catenin-induces myocardial injury following sepsis. J Pharmacol Pharmacother 2017; 8(1): 14-20. [http://dx.doi.org/10.4103/jpp.JPP_153_16] [PMID: 28405131] ]. Further, many studies investigated the pathways of myocardial inflammatory response following I/R [29Nah DY, Rhee MY. The inflammatory response and cardiac repair after myocardial infarction. Korean Circ J 2009; 39(10): 393-8. [http://dx.doi.org/10.4070/kcj.2009.39.10.393] [PMID: 19949583] , 30Panés J, Perry M, Granger DN. Leukocyte-endothelial cell adhesion: Avenues for therapeutic intervention. Br J Pharmacol 1999; 126(3): 537-50. [http://dx.doi.org/10.1038/sj.bjp.0702328] [PMID: 10188959] ] and several pharmacological agents used to suppress the effects of inflammatory mediators [31Vilahur G, Badimon L. Ischemia/reperfusion activates myocardial innate immune response: the key role of the toll-like receptor. Front Physiol 2014; 5: 496. [http://dx.doi.org/10.3389/fphys.2014.00496] [PMID: 25566092] ]. To understand the mechanistic pathway of vit D following reperfusion, we investigated the effective role of vit D to suppressed inflammatory response and improve LV function following I/R through down-regulation of ERK1/2. According to our knowledge there was no data published discussing the relationship between ERK1/2 pathway and effective role of vit D on improved cardiac function following I/R model in mice. Effect of vitamin D on survival after cardiac I/R. Effect of pre-treatment of vit D on survival after cardiac I/R. Survival rates over a 3-day period following cardiac I/R, 50% were demonstrated for the I/R group, and the I/R + vit D group (n = 8). Survival rates were analyzed by the Kaplan-Meier method using a log-rank test. Data are shown as mean ± SEM (n = 8 in each group); *P < 0.05 vs. Sham; **P < 0.05 vs. I/R and vehicle groups. Studies of the reperfusion injury pathway following ischemia and trails to control it, present without solution [31Vilahur G, Badimon L. Ischemia/reperfusion activates myocardial innate immune response: the key role of the toll-like receptor. Front Physiol 2014; 5: 496. [http://dx.doi.org/10.3389/fphys.2014.00496] [PMID: 25566092] ]. The possible causes are present of the variety experimental protocols, and multi-agents investigated to attenuate the effects of reperfusion following ischemia [32Eltzschig HK, Collard CD. Vascular ischaemia and reperfusion injury. Br Med Bull 2004; 70: 71-86. [http://dx.doi.org/10.1093/bmb/ldh025] [PMID: 15494470] ]. The enrollment of pro-inflammatory cytokines and their effects on monocyte is a comparatively recent discovery, and it opens new methodology for investigation [33Murphy E, Steenbergen C. Mechanisms underlying acute protection from cardiac ischemia-reperfusion injury. Physiol Rev 2008; 88(2): 581-609. [http://dx.doi.org/10.1152/physrev.00024.2007] [PMID: 18391174] ]. Moreover, administration of inflammatory cytokines Il-6, TNF-α, and IL-1β in experimental animals can give partly same effect to that caused by I/R lead to cardiac function suppression and mortality [34Nagarkatti P, Pandey R, Rieder SA, Hegde VL, Nagarkatti M. Cannabinoids as novel anti-inflammatory drugs. Future Med Chem 2009; 1(7): 1333-49. [http://dx.doi.org/10.4155/fmc.09.93] [PMID: 20191092] ], and this adverse effects of cytokines can be inhibited by antibodies that antagonize the effects of these mediators [35Kapoor M, Martel-Pelletier J, Lajeunesse D, Pelletier JP, Fahmi H. Role of proinflammatory cytokines in the pathophysiology of osteoarthritis. Nat Rev Rheumatol 2011; 7(1): 33-42. [http://dx.doi.org/10.1038/nrrheum.2010.196] [PMID: 21119608] ]. In the present study, we demonstrated that the suppression in cardiac parameters (heart rate, ejection fraction, cardiac output, LVEDP, and LVESP) are associated with reduced levels of pro-inflammatory cytokines in both cardiac tissue and plasma and mice after I/R. Interestingly, our data showed that these adverse effects of I/R are significantly attenuated with vit D. Moreover, treatment with vit D also reduced plasma myocardial injury marker (cTn-I) after I/R that associated with decreased level of MCP-1 expression and suppressed infiltration and migration of monocytes which improved myocardial pathological changes and less extravasation of red blood cells with margination of poly-morphonuclear leukocytes. Moreover, many studies demonstrated the potential role of ERK1/2 up-regulation in mediating inflammatory response induced-myocardium injury after I/R [36Sprague AH, Khalil RA. Inflammatory Cytokines in Vascular Dysfunction and Vascular Disease -39Gysembergh A, Simkhovich BZ, Kloner RA, Przyklenk K. p38 MAPK activity is not increased early during sustained coronary artery occlusion in preconditioned versus control rabbit heart. J Mol Cell Cardiol 2001; 33(4): 681-90. [http://dx.doi.org/10.1006/jmcc.2000.1331] [PMID: 11273721] ]. Administration of vit D shortly before ischemia attenuate the infarct size and improved hemodynamic status in mice hearts, suggesting that vit D suppressed the activation of ERK1/2 cascade through unclear mechanism. 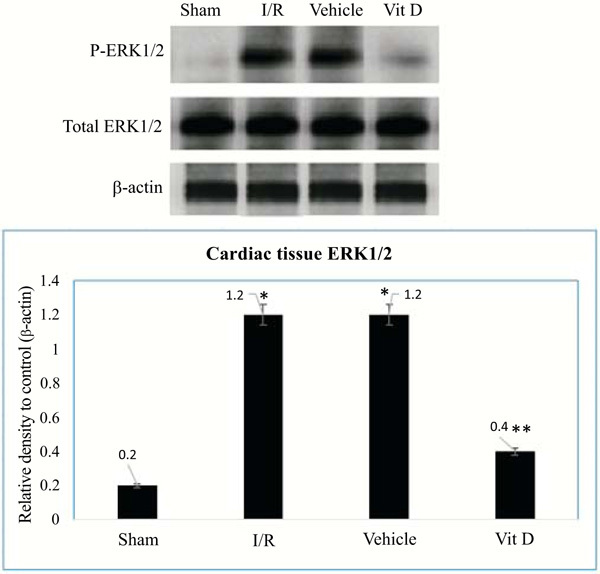 Based on this evidence data, it appears that vit D appears to be the downstream components of ERK1/2 that is responsible for inflammatory response mediating myocardial injury. This work found that ERK1/2 protein up-regulated following I/R and suppressed left ventricular function together with activated inflammatory response through unclear mechanism. Moreover, it was found that the administration of vit D improved cardiac function and attenuated chemokine and cytokines with down-regulation of ER1/ERK2 activation pathway. This study was approved by the ethics committee of Kufa University. No human were used for this study. Animals were used according to the Guide for the Care and Use of Laboratory Animals (National Research Council, revised 1996). Fuster V, Kelly BB, Eds. Promoting cardiovascular health in the developing world. A Critical Challenge to Achieve Global Health Institute of Medicine (US) Committee on Preventing the Global Epidemic of Cardiovascular Disease: Meeting the Challenges in Developing Countries 2010. 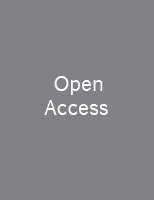 Caroline M, Michelsen T, Lorenz DM, et al. Cytoplasmic double-stranded DNA trigger NALP3 after global myocardial I/R: Crosstalk AIM2/ inflammasome. Pathophysiology of cell injury journal 2015; 4(1): 1-12. Durum R, Memon JF, Mackall TN, et al. Critical role of farnesyltransferase inhibitor in protective myocardial function after endotoxemia in rat model. AmeriJ BioMedi 2015; 2(7): 827-39. Goodman J, Putensen AA, Calandra RH, et al. Critical role of macrophage migration inhibitory factor in sepsis via interfere with MCP-1/CCL2 signaling pathway. Ameri Jour BioMedi 2015; 2(6): 688-701. Grupper R, Edward R, Walter C, et al. Critical role of microRNAs after global myocardial ischemia and reperfusuion. AmeriJBioMedi 2015; 3(7): 451-67. Hullmann G, Azfer MA, Hensley J, et al. Role of IL-1B in TLR4-mediated MCP-1expression: Renal sepsis. Ameri J Bio Medi 2015; 3(1): 22-31. Ogiku L, et al. Meloxicam attenuates brain cell injury following cerebral ischemia and reperfusion via down regulation of proinflammatory response. Pathophysi Cell I J 2013; 2(1): 1-11. Ramote D, Kishony J, Bren L. Role of Monocyte Chemoattractant Protein-1 (MCP-1) in atherosclerosis: Signature of monocytes and macrophages. AmeriJ BioMedi 2013; 2(1): 67-79. Yousif NG. Fibronectin promotes migration and invasion of ovarian cancer cells through upregulation of FAK–PI3K/Akt pathway. Cell biol intern 2013; 38(1): 85-91. Rink L, Hebel T, Fukumot J. Sepsis and signal transduction pathway: Cross-talk TLR4/ MyD88/TRIF. AmeriJ BioMedi 2015; 3(4): 150-63. Rispens E, Bron A, Lee J, Fukumoto J. The pathophysiology of inflammation in cell injury. Pathophysi Cell I J 2014; 3(1): 1-9. Turler M, et al. Dopamine signaling attenuated myocardial injury during endotoxemia. AmeriJBioMedi 2015; 3(7): 381-91. Frame RG, Henderson Chien BK, Hazen EG. ERK5 promotes TLR2-dependent up-regulation of inflammatory mediator expression induces by global myocardial ischemia. Ameri J Bio Med 2014; 8: 903-13. Vlaia M, et al. Cardiomyocyte injury: mechanism of doxorubicin toxicity effects. Pathophysi cell Inj 2014; 3(2): 73-82. Thron R, Andersson T, Lee K, et al. Over-expression of miR-486/miR-150 in sepsis: Marker in myocardial depression function. Ameri JBioMedi 2015; 3(6): 313-24. Yousif NG, Hadi N, Al-Amran F, Zigam Q. Cardioprotective effects of irbesartan in polymicrobial sepsis Herz 2017.